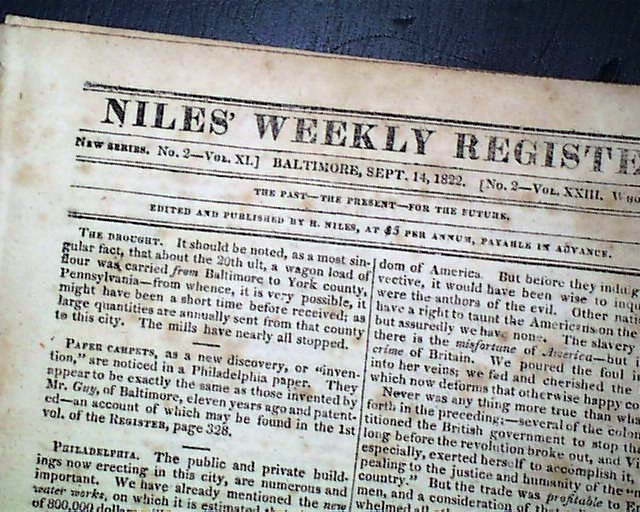 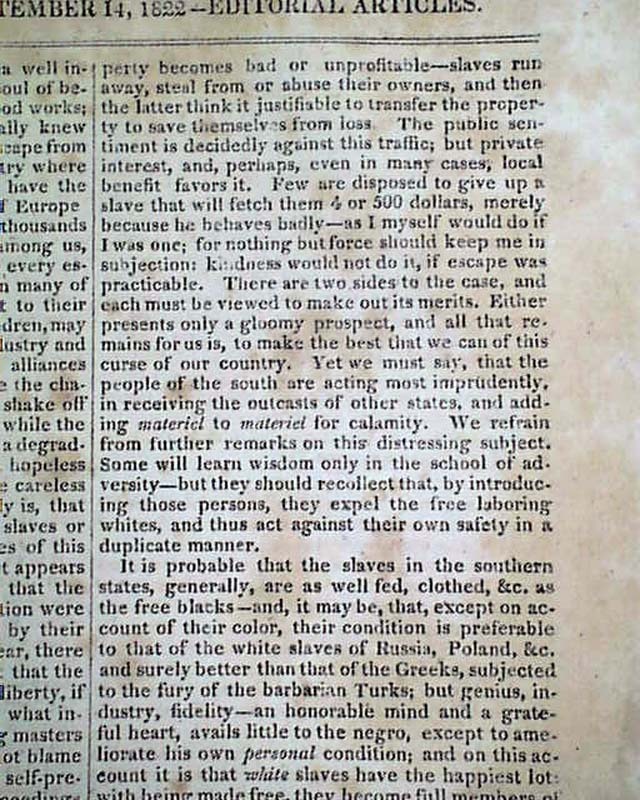 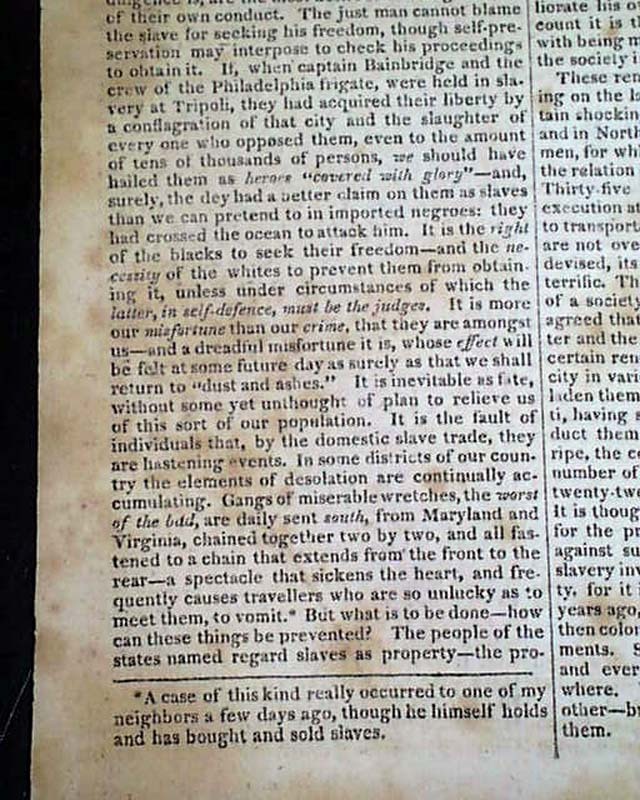 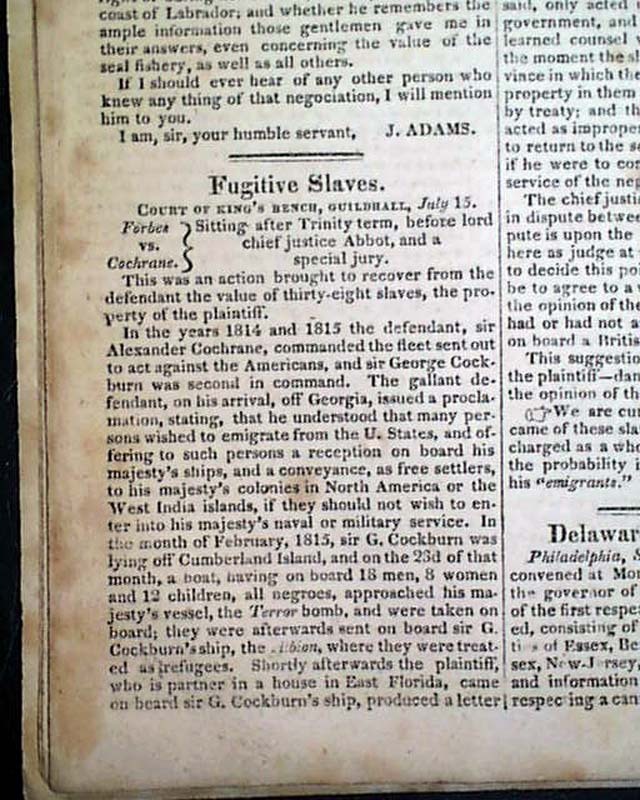 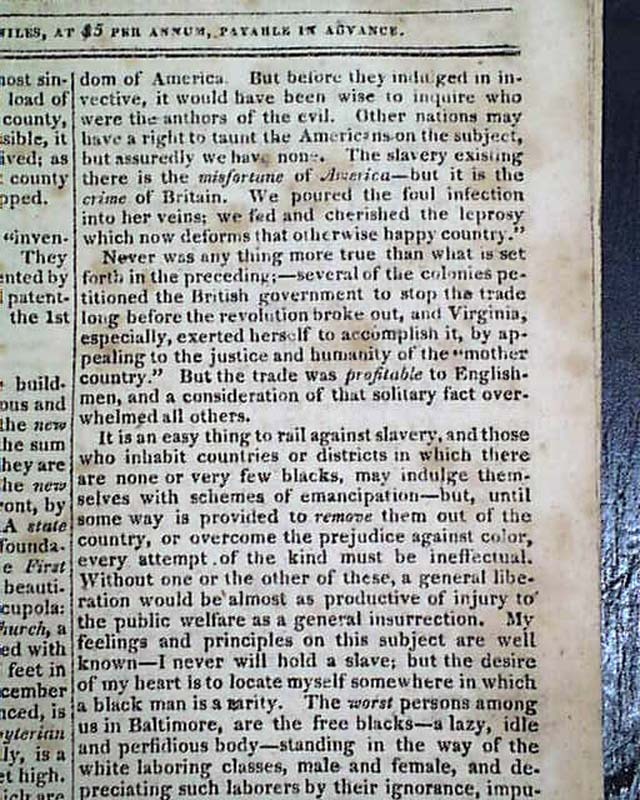 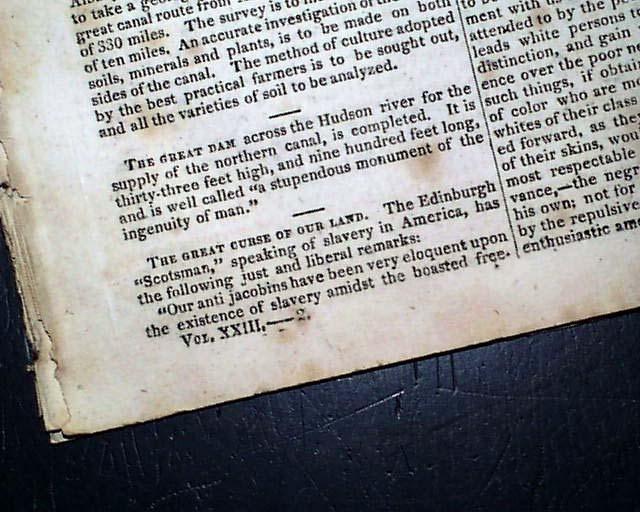 NILES' WEEKLY REGISTER, Baltimore, Sept. 14, 1822 Starting of the front page and taking the entire 2nd page is, "THE GREAT CURSE OF OUR LAND," which has much regarding slavery in America, with mention of Denmark Vesey and the slave insurrection in Charleston, South Carolina. 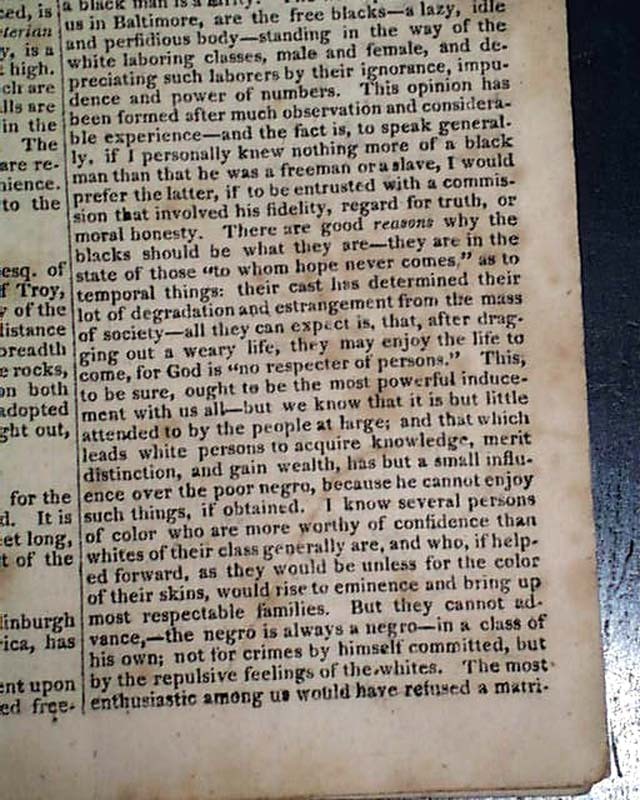 Note: Denmark Vesey was a former slave who purchased his freedom and then planned what would have been one of the largest slave rebellions in the United States. 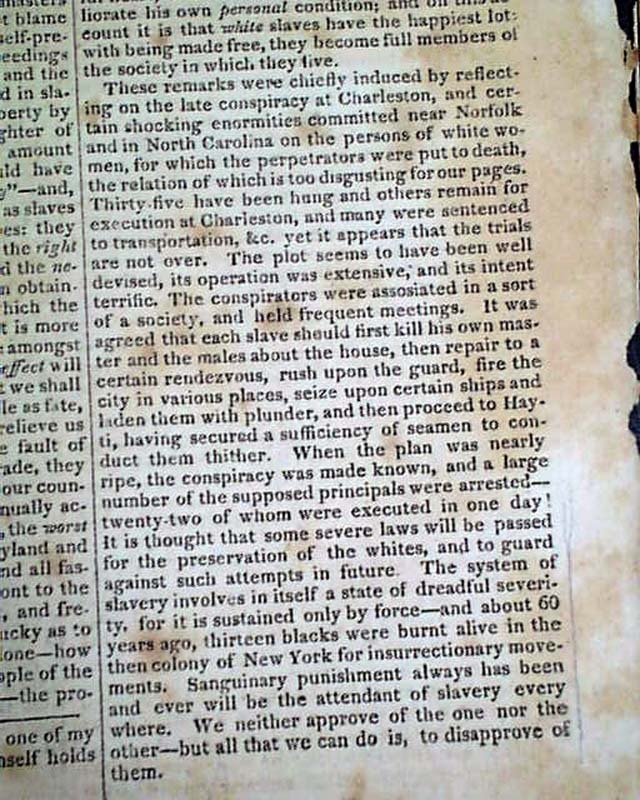 Word of the plans were leaked and authorities at Charleston arrested the plot's leaders before the uprising could begin. 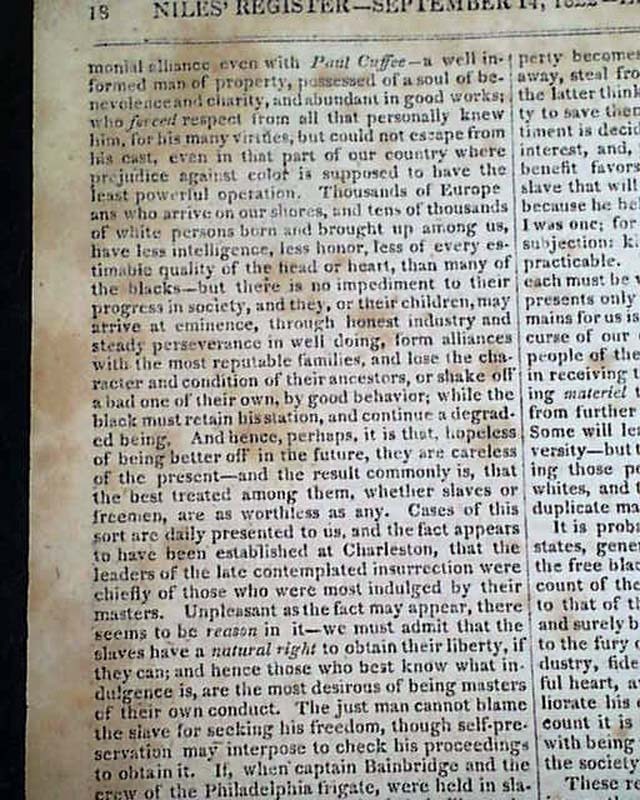 During the Civil War Frederick Douglass used Vesey's name as a battle cry to rally African-American regiments. 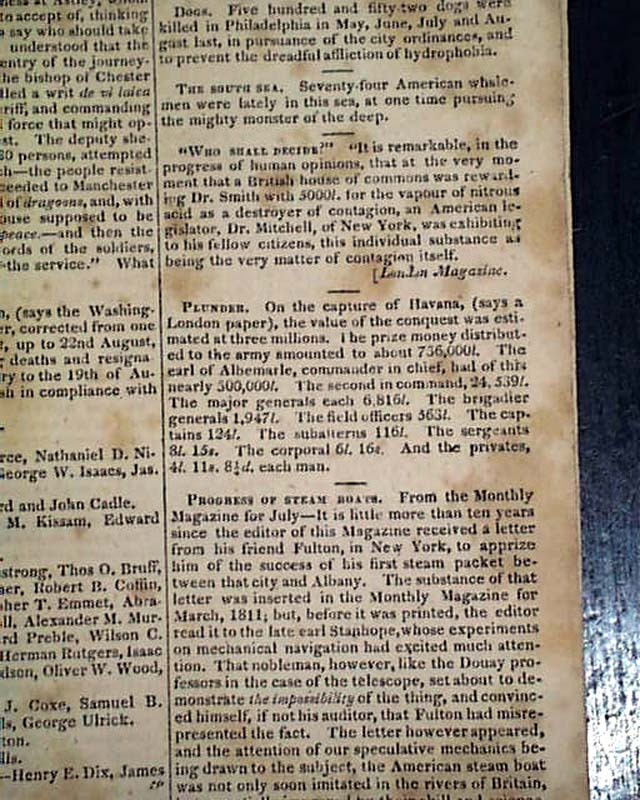 Page 19 has, "The South Sea," which states, "Seventy-four American whalemen were lately in this sea, at one point pursuing the mighty monster of the deep." 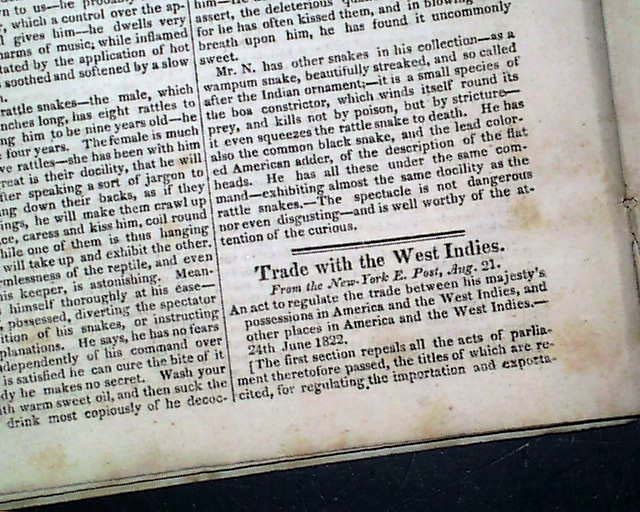 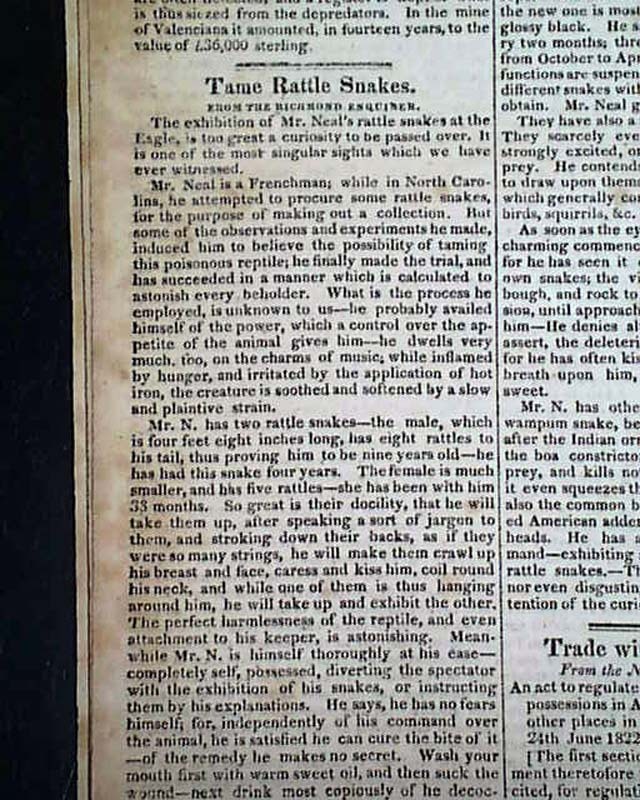 Other articles include: "Fugitive Slaves," "Tame Rattlesnakes,", "Trade with the West Indies," and more. 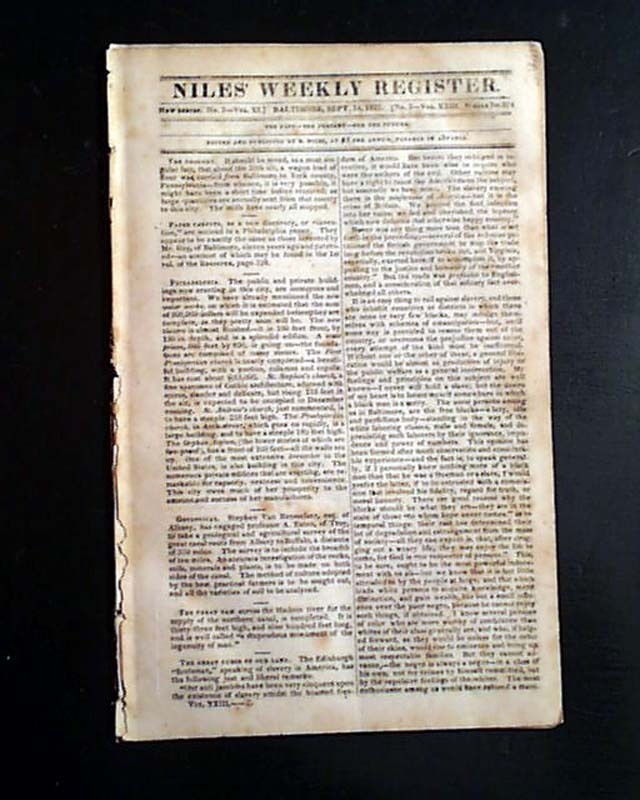 Complete in sixteen pages, 6 1/4 by 9 3/4 inches, scattered foxing, otherwise in nice condition.